When I was an elementary school kid, the one day of the week I looked forward to was Thursday. Down Eldon Road I’d hurry, up the 125 stairs I’d climb. And, like clockwork, there she would be, waiting for me in her long purple raincoat. My Granny. Each week, she would bus over to our North Vancouver home all the way from hers in Kitsilano. She was such a support to my Mom helping out with household chores, kid pick-ups and so much more. Her trip included multiple transfers and several blocks of walking…not the easiest on a 70+ year-old body. She did it with a smile on her face for over ten years and only slowed down after a three month hospital stay in her early eighties. Each week I looked forward to the treats she would bring for me and my brother: candy and little treasures she’d found at the Sally Ann. I loved everything that came out of her big Mary Poppins bag. I also loved her smell…I’ll never forget it. As I grew up, we became even closer. During my four years away at University in South Carolina, she would hand-write letters to me and I’d write back. We were like pen pals with phone conversations in between. When I’d return home for holidays, I’d bee-line to her little apartment to see her as fast as I could. They say similar family genes skip generations. I felt lucky to share many traits with her. We understood each other in a special kind of way, like soul mates do. The amount of love given to me by my Granny is immeasurable. She couldn’t ever know the impact she had on my life, because I don’t think I could ever really put it into words. She’d been a smoker the majority of her life. 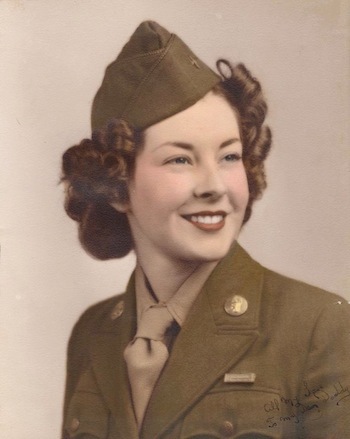 It was a habit she’d picked up in her twenties while serving in the war. We were always aware of her higher than average risk of lung cancer but the thought of her ever dying was too much to bear. At the mere mention of her passing, I’d burst into tears. I really couldn’t imagine a world without her in it. Cancer attacked my Granny’s lungs suddenly and aggressively. Within a week of her diagnosis she was admitted to the palliative care facility at VGH. The hardest thing was watching her in so much pain. It got to the point where she was so medicated, she could barely talk but would still moan from pain if she had to be moved. And then she left us…. To this day, I miss her everyday. If the Guinness Book of World Records offered a spot in their book for ‘longest cry’, I know I could win simply by thinking about her. In my Granny’s honour, I’m supporting the Canadian Cancer Society’s Dessert & Daffodils campaign by donating partial lemon loaf proceeds for two weeks this April. Lemon loaf was her favorite. Our combined efforts will make the lives of those living with cancer more comfortable and strengthen the ongoing battle against cancer. Learn more about Desserts & Daffodils here and find out where to buy To Die For Lemon Loaf here.